Five major Puget Sound projects have been given the provisional go-ahead by Congress in a massive public works bill signed yesterday by President Obama. It seems like the needed federal authorization for a $20-million restoration effort in the Skokomish River watershed has been a long time coming. This project follows an extensive, many-years study of the watershed by the Army Corps of Engineers, which winnowed down a long list of possible projects to five. See Water Ways, April 28, 2016, for details. In contrast, while the Puget Sound Nearshore Ecosystem Restoration Project (PSNRP) also involved an extensive and lengthy study, the final selection and submission to Congress of three nearshore projects came rather quickly. In fact, the Puget Sound package was a last-minute addition to the Water Resources Development Act, thanks to the efforts of U.S. Reps. Rick Larson, D-Lake Stevens, and Derek Kilmer, D-Gig Harbor, along with Sens. Patty Murray and Maria Cantwell. Through the years, I’ve written a lot about the Skokomish River, which begins in the Olympic Mountains and flows into the south end of Hood Canal. The wide, productive estuary might be described as the elbow of this long, narrow waterway that bends up toward Belfair. I’ve heard it said that Puget Sound cannot be restored to health without a healthy Hood Canal, and Hood Canal cannot be restored to health without a healthy Skokomish River. Whether that is true remains to be seen, but I have no doubt that the Skokomish River watershed is coming out of a dark period of abuse with hope of becoming one of the most productive streams in the region. Much of the credit for the transformation goes to a group of men and women from a variety of agencies, occupations and ways of life who came together with an understanding of the historic value of the Skokomish River and a vision for what the river could become again. This was the Skokomish Watershed Action Team, or SWAT, which celebrated its 10th anniversary last year. To be sure, it was basically loads of money that began to transform the abused Skokomish River watershed to a much more productive system. But the people in charge of the federal, state, local and private dollars were able to see the Skokomish as a worthy cause, thanks to the groundwork laid by the SWAT. Disappointments have been few, as one project after another brings this long lost river back to life. Yes, I have written a lot about the Skokomish River, its history and its future. 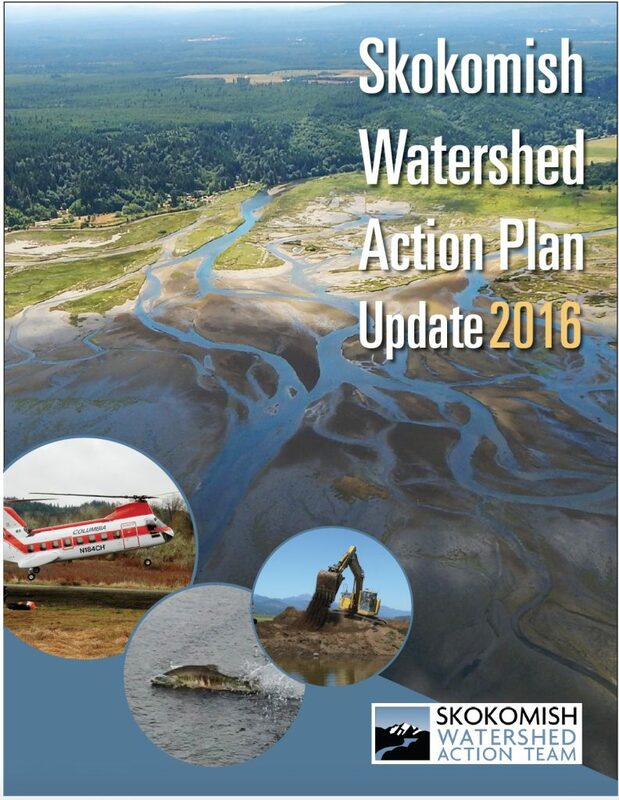 That’s why I was glad to see the 10-year update to the Skokomish Watershed Action Plan (download, PDF 113 mb). The document contains an extensive account of the projects completed and the milestones passed through the years. Whether you are intimately involved in the watershed or just want to know what the heck I’m talking about, take a look at the report released this week. Logjam soon after installation in 2010. Since 2005, nearly 50 restoration projects were completed — from removal of old logging roads high in the mountains to the re-establishment of tidal channels in the lower estuary. Salmon are being reintroduced to the North Fork of the Skokomish River, including the dammed-up Lake Cushman, thanks to a legal settlement between Tacoma and the Skokomish Tribe. Later, a deep pool forms behind the jam. About 12 miles upstream in the South Fork of the Skokomish, a series of 30 logjams were installed and almost immediately began to restore the channel to a more natural habitat for fish and other aquatic creatures. This area was part of a four-mile stretch that was heavily logged in the 1950s for a reservoir that never happened. Once the logjams were in place, the area began to store massive loads of sediment, which always created problems as they washed downstream into the lower river. The river’s characteristic problem of spreading out and slowing down was reversed, as width-to-depth ratios decreased and the average depth in the middle of the river increased by two feet. The number of pools deeper than five feet doubled from three to six, and the piles of wood grew larger by capturing logs floating downstream. The new report also lays out plans for the watershed in the coming years, including projects identified in a major study by the Army Corps of Engineers. A Corps proposal to fund $20 million in restoration projects is now before Congress, as I described in Water Ways in April and June. Other projects have been proposed for separate funding, as outlined in the new report. 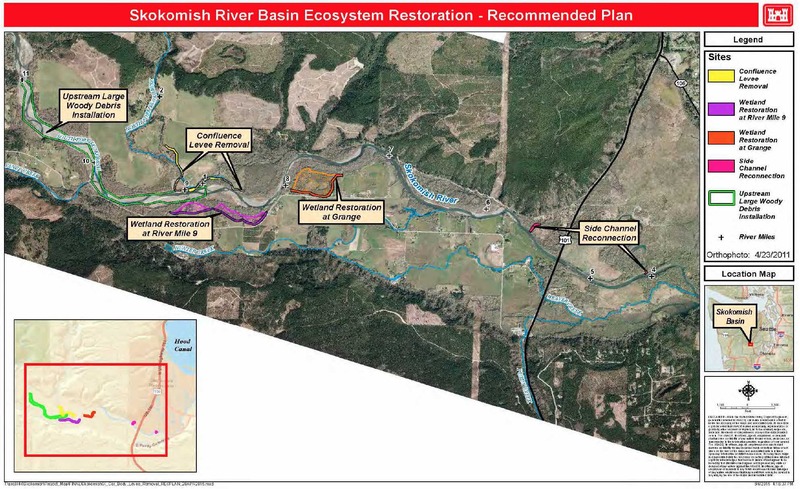 The Skokomish River ecosystem restoration project, as proposed by the Army Corps of Engineers, remains on track. The House Transportation and Infrastructure Committee on May 25 unanimously endorsed the Water Resources Development Act, which would authorize the project. The legislation must still be approved by the full House and Senate. After decades of in-depth studies and anxious waiting, restoration of the Skokomish River ecosystem took a major step forward today, when a committee of the U.S. Senate endorsed the $20-million effort as part of a larger legislative package. The Skokomish restoration was one of many projects that sailed through the Senate Environment and Public Works Committee as it passed a $9-billion authorization bill on a 19-1 vote. The bill must still be approved by the full Senate and House, but supporters of the Skokomish restoration were thrilled with the light at the end of the tunnel. Rich Geiger, project engineer for the Mason Conservation District, has been shepherding the Skokomish effort for as long as I can remember. I asked him how it feels to finally see some action in Congress. “It feels really really good,” he said slowly, emphasizing each word. 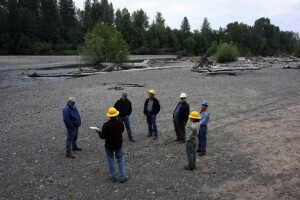 The restoration program consists of five separate projects along the Skokomish River. Although not designed for flood control, these projects for improving ecological health are expected to reduce flooding along one of the most frequently flooded rivers in the state. The restoration effort has received support from far and wide. As Rich likes to point out, experts generally agree that Puget Sound cannot be restored without restoring Hood Canal, and Hood Canal cannot be restored without restoring the Skokomish River. Sen. Patty Murray has been a strong advocate for the project. U.S. Rep. Derek Kilmer, D-Gig Harbor, said improving the health of the Skokomish River would be a boon for Mason County and the entire region. He said he applauded the efforts of the Skokomish Watershed Action Team, the Skokomish Tribe and area residents who worked together to shape the restoration program. The $9-billion authorization bill, known as the Water Resources Development Act of 2016 (PDF 4.1 mb), includes money requested by the Army Corps of Engineers for water-related projects across the country. In additional to restoration efforts, the bill includes authorization of projects related to flood control, dredging, drinking water emergencies, water treatment and pipelines. For a summary of the bill see the report to the committee (PDF 284 kb). The bipartisan endorsement and near-unanimous support offers hope that the needed money will be approved in a future appropriations bill tied to the budget, Rich Geiger told me. He is also optimistic that the 35-percent state/local match will be made available through state grants or a legislative appropriation. The federal share for the project would be about $13 million and the state share nearly $7 million. Some money has already been provided for engineering work, Rich said. If things go well, the final designs can be ready for the start of construction in October of 2019. Wetland restoration near Grange: Larger breeches are planned for the levee near the Grange hall at river mile 7.5 to 8. A new levee, up to 10 feet tall and 2,900 feet long, would be constructed 1,200 feet farther back with no increase in flood risk. Locations are still under discussion. Estimate cost $3.3 million. Large woody debris: Upstream of the confluence with the North Fork, large woody debris would be installed. Large clusters of trees with root wads, as well as some single trees, would be placed between river mile 9 and 11, as measured from the estuary in Hood Canal. Estimated cost: $3.2 million. The original plan for the Skokomish, as developed in an early report by the Army Corps of Engineers, called for more projects and would have cost closer to $40 million. Some of those other projects are being funded through other programs, such as the Salmon Recovery Funding Board. For example, the reconnection of a stagnant section of Weaver Creek to the free-flowing Purdy Creek is scheduled for this summer using SRF Board money. In addition, numerous man-made logjams are being planned to create salmon habitat, reduce sediment flows and stabilize the stream channel. Also, preliminary designs and discussions are underway to relocate Skokomish Valley Road, a main route into the Olympic Mountains. Moving the road would allow for the removal of levees, river bank restoration and a reconnection to about 60 acres of floodplain. It’s turning out to be a good Christmas for the Skokomish watershed in southern Hood Canal, where numerous restoration projects recently received a green light. Restoring the Skokomish River ecosystem is often regarded as essential to restoring Hood Canal to a healthy condition. 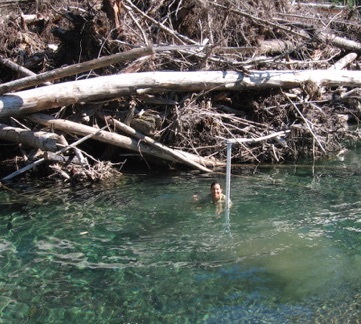 Work over the past 10 years has reduced sediment coming from the Olympic Mountains, improved flow conditions in the river and restored tidal mixing and native vegetation in the vast Skokomish estuary. Continuing efforts — including a new fish-passage facility in the North Fork of the Skokomish — are contributing to an increase in species diversity and improved salmon habitat. The latest news involves future restoration efforts, including an award of five grants totaling $1.4 million from the state’s Salmon Recovery Funding Board. In addition, top officials in the Army Corps of Engineers have endorsed the long-awaited Skokomish River Basin Ecosystem Restoration Plan, expected to cost about $20 million. “We are making solid progress on all fronts,” said Mike Anderson of The Wilderness Society who serves as coordinator of the Skokomish Watershed Action Team. The action team, which celebrated its 10th anniversary this year, includes representatives of federal, state and local agencies, the Skokomish Tribe, environmental groups, business interests and area residents. It has been rewarding for me to watch the coordinated efforts — from the U.S. Forest Service working high up in the Olympic Mountains to the Skokomish Tribe and Mason Conservation District working on the tidelands of Hood Canal. For a history of the struggle, please read my 2009 series “Taming the Skokomish.” Part 1, the people; Part 2, farming; Part 3, logging; Part 4, the restoration. When culverts fail, streams can become inundated with sediment. The Forest Service has been removing unneeded roads in the Skokomish watershed for 20 years. 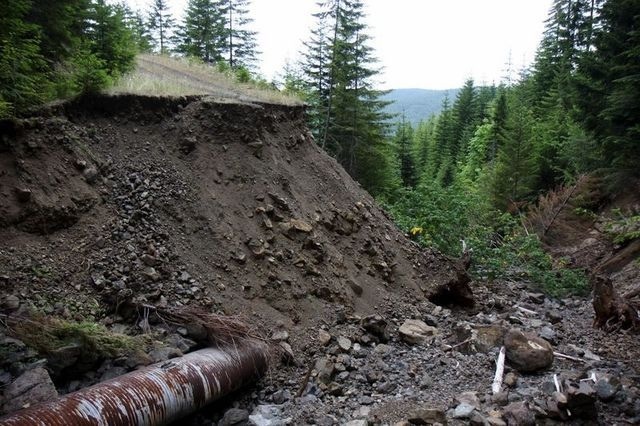 On a related note, the Forest Service recently announced that it has completed its effort to remove unneeded logging roads and make sure they no longer contribute sediment to nearby streams and the Skokomish River. In all, more than 200 miles of roads have been decommissioned over the past 20 years. The Forest Service is now moving ahead with “vegetation management” on some 4,500 acres of timberland in the Lower North Fork and Lower South Fork of the Skokomish River. The project involves commercial timber harvest and restoration treatments in an effort to accelerate the return to old-growth conditions. See Vegetation Management Project. A Dec. 14 letter (PDF 818 kb) from the Army’s chief of engineers moves the Skokomish restoration project one step closer to congressional approval. Car body levee removal: This levee was built with old cars at the confluence where the North Fork flows into the mainstem of the Skokomish. Some 5,000 feet of the levee would be removed. A small channel would be created to allow water from the mainstem to flow into the North Fork and return at the existing confluence. Large woody debris would help direct water into the channel. Estimated cost: $7.5 million. Setback levee at river mile 9: The existing levee would be breached in four locations, and a new levee would be built some 200 to 300 feet farther away. The levee would allow for minor over-topping but would not increase the flood risk. Estimated cost: $2.4 million. Grange levee: Larger breeches are planned for the levee near the Grange hall at river mile 7.5 to 8, compared to the levee at river mile 9. A new levee, up to 10 feet tall and 2,900 feet long, would be constructed 1,200 feet farther back with no increase in flood risk. Locations are still under discussion. Estimate cost $3.3 million. If approved by Congress, the federal government would pay 65 percent of the cost, with 35 percent coming from state and local governments. 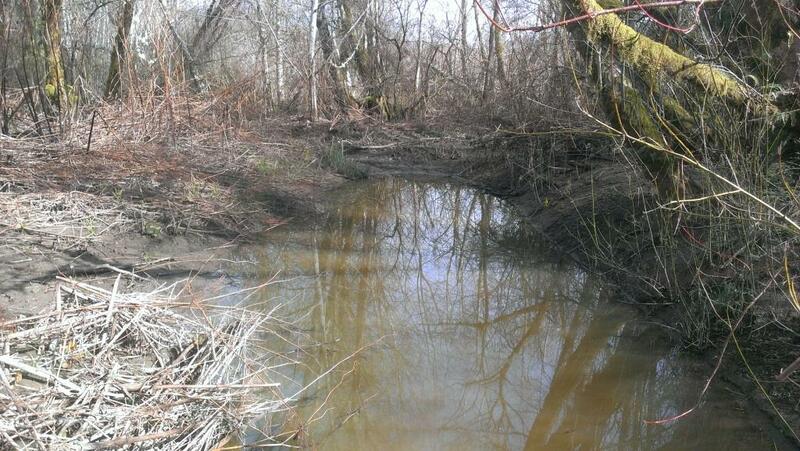 Reconnecting Weaver Creek, $200,000: A new 750-foot channel will connect a stagnant portion of Weaver Creek to the free-flowing Purdy Creek, and about 25 logs will be installed. In addition to improved flows, the project will boost oxygen levels in the stream. The sponsor, Mason Conservation District, will contribute $153,000 from a separate federal grant. South Fork Logjams, $225,000: Twenty-two man-made logjams will be added to the Holman Flats area in the South Fork of the Skokomish River to create salmon habitat, reduce sediment flows and stabilize the stream channel. This area was once cleared for a reservoir that was never built, resulting in excess sediment that destroys salmon spawning beds. The sponsor, Mason Conservation District, will contribute $469,000 from a separate state grant. Logjam priorities in Upper South Fork, $305,000: Mason Conservation District will study a 12-mile stretch of the Upper South Fork of the Skokomish to develop a prioritized list of the best places to install future logjams. Logjams are designed to improve fish habitat, reduce sediment movement and stabilize stream banks. The conservation district will contribute $54,000 and labor. 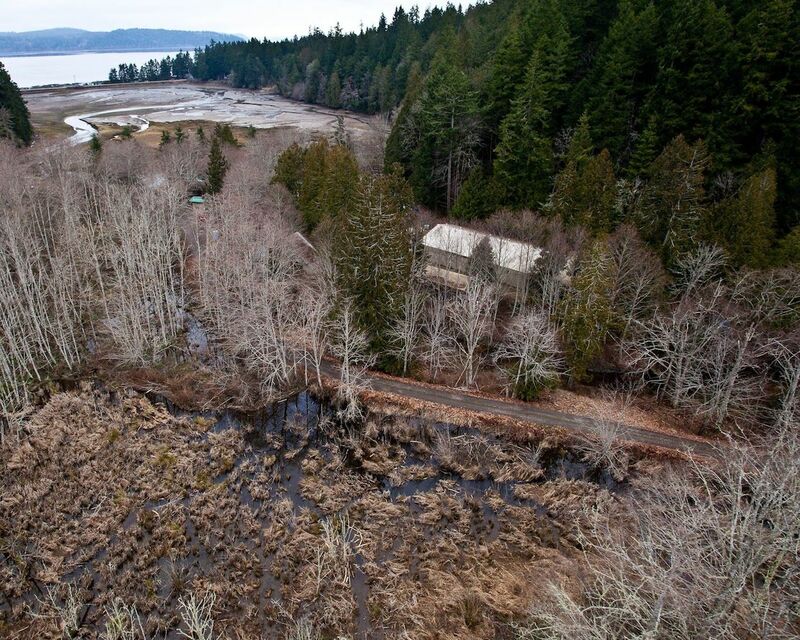 Logjam designs for Skokomish, $265,000: Mason Conservation District will work with landowners to select a design for logjams on a 1.6-mile stretch of the Skokomish River that lacks shoreline structure. The conservation district will contribute $47,000 in donations of equipment. Concepts for moving Skokomish Valley Road, $363,000: Moving the road away from the South Fork of the Skokomish River would allow for the removal of levees, restoration of the river banks and reconnection of the river to about 60 acres of floodplain. This project would investigate possible locations for a new road as well as the possible addition of a meander to the river channel and the removal or relocation of a bridge over Vance Creek. The sponsor, Mason Conservation District, will contribute $64,000 from a separate federal grant. The goals of the Skokomish restoration and progress in the watershed are reported in an “effectiveness monitoring” document by the Puget Sound Partnership. Progress on other watersheds and strategic initiatives are reported on the “Effectiveness Monitoring” webpage. The Army Corps of Engineers is moving forward on a $40-million restoration program along the Skokomish River, as I mentioned in Water Ways last week. 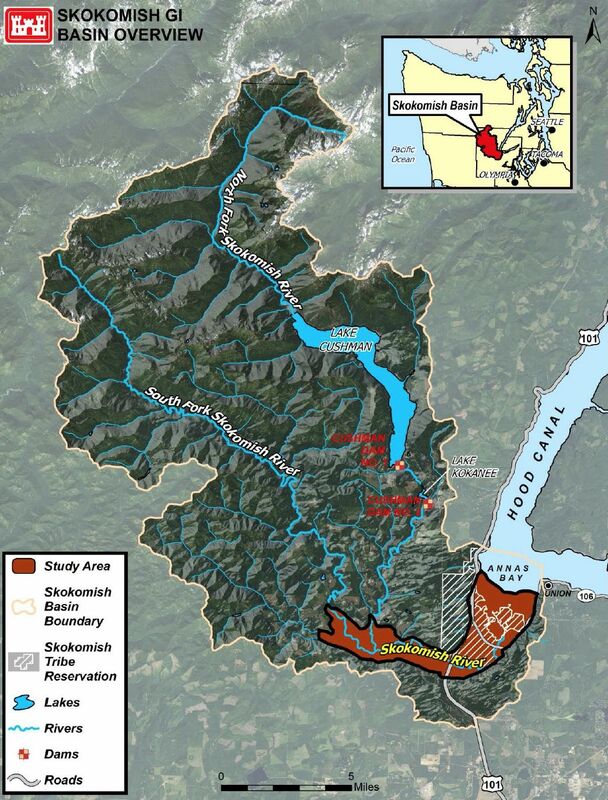 According to Rachel Mesko of the Army Corps of Engineers, two major projects have been dropped from the “tentatively selected plan” for the Skokomish, which flows into the south end of Hood Canal. That leaves five major projects to advance forward for a likely recommendation to Congress. Rachel presented a status report on the program during a recent meeting of the Skokomish Watershed Action Team. It’s hard to remember how long I’ve been writing about the Army Corps of Engineers’ involvement in the Skokomish. So I looked it up. The agency completed a flood analysis in 1988, considered dredging options in 1995 and began work on the current “general investigation” in 2000. Before I talk about the projects being proposed, I’d like to recall what is at stake in the Skokomish, often cited as the most frequently flooded river in Washington state. Many people believe that the restoration of Hood Canal, a gem of an ecosystem, cannot be successful without first fixing the Skokomish, where individual restoration projects have been underway for years. 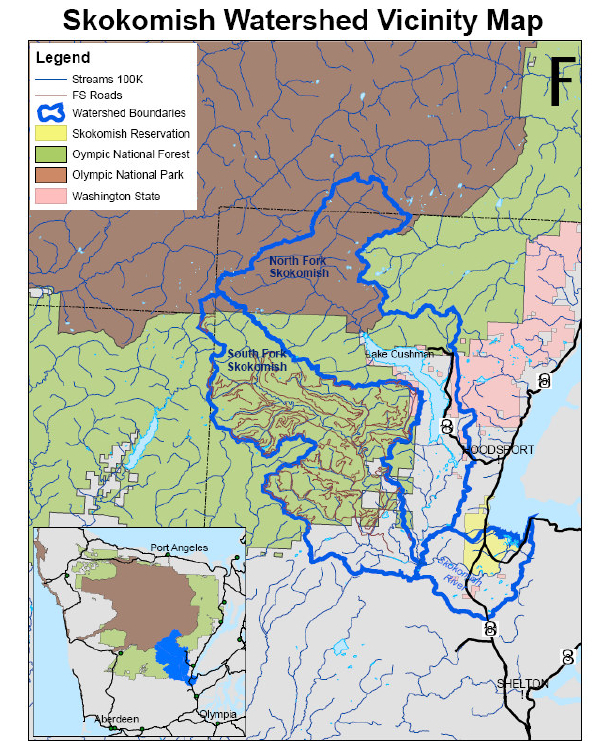 Here’s a brief description of the problems from the feasibility report on the Skokomish River Basin Ecosystem Restoration (PDF 5.3 mb). “High sediment load, reduced flows and encroachment on the floodplain by man-made structures are causing continued degradation of natural ecosystem structures, functions, and processes necessary to support critical fish and wildlife habitat throughout the basin. “The decline in populations has resulted in the listing of four anadromous fish species under the Endangered Species Act — chinook salmon, chum salmon, steelhead, and bull trout — that use the river as their primary habitat. Historical removal of large woody debris has simplified the stream, wiping out pools, eliminating places for young fish to hide and reducing nutrients, which feed aquatic insects and support an entire food web. Logging along the river has eliminated the supply of large woody debris, the shade to cool the stream and the overhanging vegetation, a key part of the food web. 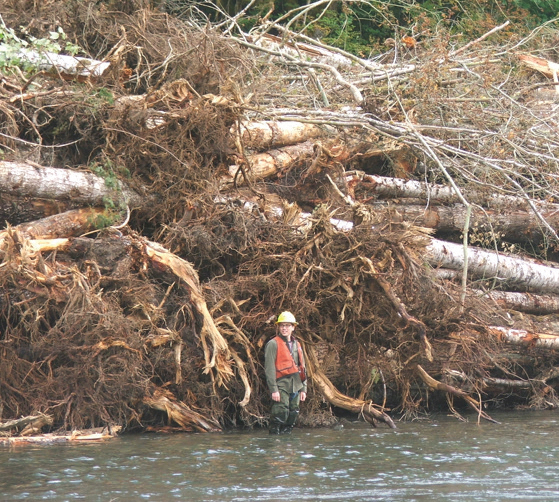 Logging also has increased erosion which prevents new vegetation from taking hold, smothers salmon eggs and fills in pools, where salmon can rest. Levees built to protect farmland from flooding halted the natural movement of the river, known as channel migration, and prevented the formation of new habitats. Logging upstream in the South Fork of the Skokomish River and Vance Creek increased erosion and movement of sediment into the lower river, cutting off fish access to side channels, wetlands and other aquatic habitats. The Cushman Dam Project blocked 25 percent of the mainstem habitat and 18 percent of tributary habitat available for salmon in the North Fork of the Skokomish River. Reduced flows below the dam increased sedimentation in the lower Skokomish. As a result, about a mile of the river dries up about two months each summer, blocking salmon migration. Highways 101 and 106 disrupted natural floodplains that can be used by fish to find food and to escape high flows and then find their way back to the river. The costs above were taken from the feasibility study and do not include design, planning and related costs. You might note that the River Mile 9 levee and the Grange levee fit the concept of “Floodplains by Design,” an idea supported by The Nature Conservancy and funded by the Washington Legislature with $44 million. Check out the Associated Press story. After discussions with nearby property owners, two projects were removed from the preliminary list. They involve excavation work on both Hunter and Weaver creeks to restore the tributaries to more nature flows. Rich Geiger, engineer for Mason Conservation District, said the Skokomish restoration program seems to have wide support among landowners in the Skokomish Valley as well as among interest groups, including the Skokomish Watershed Action Team. As a result, he expects that the project will maintain momentum all the way to Congress. “There is support (for the Skok project) through the Corps chain of command and all the way up to the national level,” he added. If things go well, a final plan for the Skokomish could be ready by late next summer, according to Rachel Mesko. By the way, I would like to publicly thank the SWAT for the “certificate of appreciation” I was given for my reporting on Skokomish River through the years. It’s an honor to be associated with this group of men and women who are fully committed to seeing the Skokomish River restored to a healthy ecosystem. Flood control is no longer a primary objective of federal restoration work on the Skokomish River — but improving the ecosystem is likely to reduce flood problems for people who live in the valley. 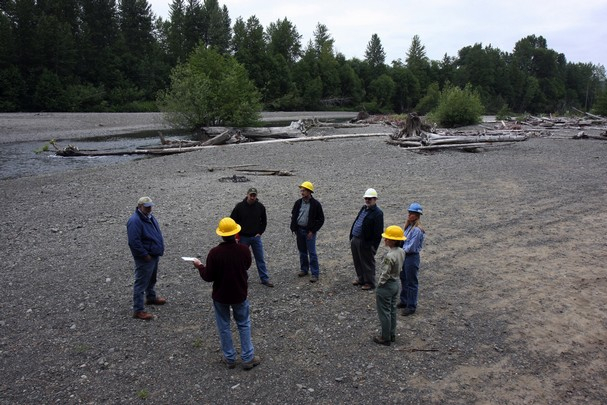 The Skokomish Watershed Action Team (SWAT) surveys an area where the Skokomish River has wiped out all vegetation and left a massive gravel bar. We don’t need to be reminded that the Skokomish is the most frequently flooded river in the state. Although I’m not sure how soon another river might take over that dubious distinction, it’s easy to see that a lot of time and money is being spent to get the river back to a more natural condition. The Army Corps of Engineers, known for massive projects such as dikes, dams and dredging, won’t be adopting those sorts of projects for the Skokomish River. For further explanation, check out my story in Monday’s Kitsap Sun. The good news is that the Corps has not turned its back on the Skokomish. In fact, the river is considered so important to the Hood Canal region that the agency is considering some large-scale projects focused on environmental restoration — including possibly relocating Skokomish Valley Road. Other interesting ideas include creating sediment traps to capture gravel in selective locations, relocating existing dikes to create a wider river channel, forming new side channels to relieve flow on the main river and even aeration pumps to boost oxygen levels in Hood Canal. Many of the projects designed for ecological improvement will also reduce the flooding problems. A report, scheduled to be released in late spring or early summer, summarizes all information collected so far in the $4.7 million study of the Skokomish River watershed. The report will cover current ecological conditions, future ecological conditions without restoration and a list of potential restoration projects — including preliminary design, estimated costs and ecological benefits, Winkler told me. Potential projects are only conceptual at this point, though experts have begun to look at locations along the river where different types of efforts may be fruitful. Further study will narrow the list of to a plan to be submitted to Congress for funding.